14k White Gold or 14k Yellow Gold. 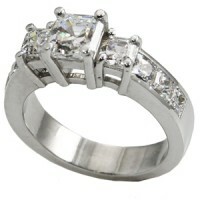 2.50 Carat TW Russian Cubic Zirconia's (3/4 ct center asscher cut, 2- 1/3 ct asscher cut side stones). 6 - Channel Set Princess Cuts down the sides. Gorgeous, Top Quality Rings, Russian CZs!!! Nice traditional style ring. VERY HEAVY RING! Matching channel set band available! This beautiful ring is made-to-order just for you and takes 7-14 days.